Crossbow Academy: ballistics, sighting, tuning 20" 34.75" / 8.9 lbs. 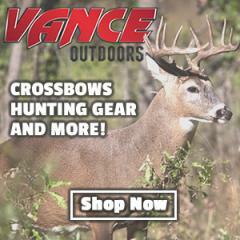 - Scope only offers aiming points to 60 yards Small Game Hunting? 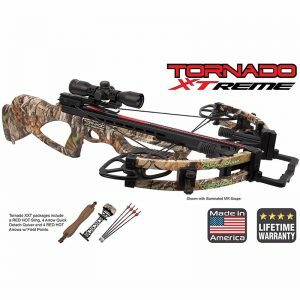 Hi, welcome to my review of the Parker Tornado XXTreme crossbow. Parker is well known for its compound bows, but the company also makes some excellent x-bows. The Tornado XXTreme is new for 2017, and incorporates Parker’s Xtreme Xbow Technology (XXT). XXT includes inverted cams, a split limb array, a cavity-back riser, and high performance synergy cams to maintain speed, quiet operation, and ease of cocking in a smaller form factor. Let’s see if all of that fancy technology makes for a good x-bow or not. The x-bow comes mostly assembled, but divided into three parts. The sling, scope, foot stirrup, and quiver bracket are already attached. All you have to do is mount the stock to the rail and riser section, and then install the quick-release fitting for the quiver onto the quiver bracket. There are a grand total of eight screws to attach – I counted. How Easy Does the Scope Sight In? This model boasts an arrow velocity of 365 FPS with 400-grain bolts, delivering 118 foot-pounds of kinetic energy. Sure, there are slightly faster and more powerful x-bows out there, but this is quite strong enough to take down the largest, toughest game legal to hunt in North America. Your arrows will likely go completely through your compressed foam target and halfway into your backstop, as they did for me. Accuracy, once sighted in, is nothing short of astounding. I can maintain groups less than an inch in diameter from 20 yards, and my patterns are about two inches wide from 50 yards. The accuracy of this x-bow is definitely good enough for hitting the vitals of any game you might want to hunt, as long as you have a steady hand and good eye. Will Hunters Enjoy the Tornado XXTreme? The Parker Tornado XXTreme has a lot of features that hunters will love. It’s fairly compact, measuring just 34.75 inches long and 20.625 inches wide axle-to-axle uncocked. When cocked, it’s just 18 inches axle-to-axle. The x-bow is quiet, accurate, and powerful. Unfortunately, it’s also quite heavy at 8.9 pounds with only the scope mounted. Add on your quiver and four arrows, and the x-bow tips the scales at 9.2 pounds. If you’re a smaller-framed hunter, you might not like hauling this on your back through the woods. The draw weight of this model is 165 pounds, and Parker doesn’t include a rope cocking device with the Outfitter packages. This is a major mistake, in my opinion, given the price point of the x-bow compared with the competition. A rope cocking device isn’t all that expensive, and should be included for safety and accuracy. Fortunately, I have several of them. Using a rope cocking device, you bring the draw weight down to around 80 pounds, and the string pulls back smoothly and consistently. It latches firmly behind the trigger latch, and then you’re ready to load your arrow and get to shooting. The 3x32mm illuminated multi-reticle scope is quite nice, and features aiming points out to 60 yards. Scopes are getting more advanced, though, with 100-yard x-bow scopes quickly becoming the standard others should strive for. Parker might want to think about that for 2018, to be honest. Still, it’s a great scope with perfect illumination settings in either red or green. You get four RED HOT High Velocity arorws with the x-bow, along with field tips. These arrows are excellent quality, and I often buy them to use with my other, non-Parker x-bows. You won’t go wrong with these, but if you prefer another brand you’re obviously free to get them. Just make sure you have 20-inch arrows with capture nocks, weighing at least 400-grain. The design of the Tornado XXTreme is top notch, with a definite eye to safety. The auto-engaging ambidextrous safety is conveniently located on the rear of the receiver, and the anti dry-fire device functions perfectly. The polymer stock has a flange molded into it, to keep your fingers clear of the string’s path. Parker offers a limited lifetime warranty for the original owner of the crossbow. The warranty card must be completed and mailed in within 15 days of purchase, but you can also register your warranty online. Just do so within 15 days of purchase, or you’re out of luck. Thanks for reading my review. The Parker Tornado XXTreme is quiet, accurate, and powerful enough for any hunting situation. The included scope is terrific. The only real downside is the x-bow’s weight. Make sure to check today’s Amazon.com price on the Parker Tornado XXTreme Crossbow if you’re interested.